If you’re waking up in the morning with aches and pains, it may be time to consider a new mattress. When searching for a new bed to get a more comfortable night’s sleep, it’s important to reflect on and take into consideration your own sleep needs. In addition, it’s also necessary to do some research on which mattress would be the best for you. With so many options available, finding the best online mattress is harder than ever before. In this guide, we’ll be discussing GhostBed mattress reviews and what goes into making their beds, to help you decide if their brand is right for you. Launched in 2015, GhostBed hit the market as an extension of the Nature’s Sleep brand. The CEO of Nature’s Sleep, Marc Werner, founded his sleep company after years of struggling to find a comfortable mattress. When every mattress he tried caused aches and pains, he decided to invent his own. Nature’s Sleep was founded in 2001, nearly two decades ago. When GhostBed was launched, it was a milestone for the company as it was their first mattress they were selling online and shipping to customers nationwide in an eco-friendly easy-to-ship box. Since they started in 2015, they’ve added three mattresses to their collection: The GhostBed, GhostBed Luxe, and GhostBed Flex. All of their beds are CertiPUR-US® certified, meaning they’re free from ozone depleters, mercury, lead, formaldehyde, phthalates, TCEP flame retardants, and low in VOCs. This model is a mixed-foam bed made from a layer of latex foam, a layer of gel memory foam, and a layer of high-density poly-foam. The cover of this model is made from a blend of viscose and polyester, making it both stretchy and soft. The first layer of the bed is 1.5-inches of aerated latex foam; this latex layer pulls heat away from your body and provides a bit of bounce, keeping you cool and preventing you from sinking into the bed. The next layer is made from 2 inches of gel memory foam. Gel memory foam is designed to sleep cooler than traditional memory foam; this material cushions you while working with the latex layer above to keep you cool. The core layer of this mattress is made from a 7.5-inch block of high-density poly-foam, this layer is meant to support the mattress and prevent sagging and deterioration over years of use. They rank this mattress a 6.5 out of 10, or medium-firm, in regards to firmness and recommended it for sleepers of any style. The Flex model is a hybrid model, combining both foam and a coil system to provide bouncy, comfortable support. The cover of the Flex is made from three layers, the outermost cooling fabric, the 1-inch layer of cooling fiber woven into the cooling fabric, and a 1-inch layer of gel memory foam infused with the layer above to work in conjunction with the other cover materials. By combining these three layers into a cooling cover, it significantly reduces your chances of waking up hot throughout the night. The first layer of the mattress is made from a 1-inch layer of gel memory foam, this layer absorbs your body heat and transfers it out of the mattress. Next, comes a 1-inch layer of transition foam, this layer contours to your body and prevents motion transfer throughout the mattress, making it an ideal choice for those who toss and turn. The transition layer also acts as a cushion between the foam layers above and the coil system directly below. The pocketed coil system below the transition layer is designed to relieve pressures points in your joints and support your spine while you sleep. 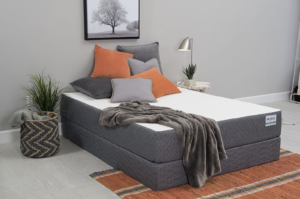 Additionally, by including coils in their design they drastically improve the edge support of their mattresses, meaning you can sit on the sides without sliding onto the ground. Below the layer of coils is a 1-inch layer of high-density poly-foam acting as the core of the mattress. If you prefer a more traditional innerspring-type feel from your mattress, the Flex is a great option. Though it has bouncy responsiveness, it still cushions your body and provides healthy support. The Flex is also a medium-firm firmness, similar to the Luxe model. The Luxe model is a step up from their original all-foam model. The cover of the bed contains three layers, and the mattress itself has four layers— a lot of materials go into making this bed feel luxurious. The outermost layer of the cover is their proprietary Ghost Ice Fabric, designed to feel cool to the touch. Inside the cover is a layer of Cool Fiber and a layer of gel memory foam; these two materials work together to create a cooling sleeping environment. Because memory foam tends to sleep hot, they designed their cover to prevent you from heating up on their bed. Inside the mattress is four layers of mixed-foam. The top layer is their unique Ghost Ice Layer, this gel memory foam pulls heat away from your body while you sleep. Below this layer of gel memory foam lies a thicker 2-inch layer of gel memory foam meant to relieve pressure and wick away any body heat you may naturally emit while you rest. Next, comes the 2-inch layer of bounce foam, designed to have bouncy responsiveness similar to latex but cushion like memory foam. Last, comes the core of the mattress made from a 7.5-inch block of their high-density poly-foam. The comfort and support layers of this mattress are similar to the original GhostBed, but the Luxe has additional cooling technologies providing a cooler sleep environment, helping you sleep longer. This model is ranked a 5.5-6.5 out of 10 in regards to firmness, putting it right there in the middle of soft and firm. The Original GhostBed runs for $995, the Luxe costs $1,575, and the Flex is $1,485 (based on Queen prices). They also offer multiple different financing options, giving you the option to pay for your bed in monthly payments rather than paying the full price at checkout. Additionally, every mattress comes with free shipping to the continental US. When you buy your mattress directly from GhostBed, it comes with a 101-night sleep trial that lets you test your new mattress in your home. If you decide after sleeping on it for at least 30 days that it’s not the best option for you, they’ll return it for you for free and issue you a 100% refund. The 20-year warranty covers any lasting body impression greater than 1-inch or any physical flaw in the materials in the mattress causing splits or cracks. Any defects in the cover of the mattress are only covered for the first year after you purchase, should any arise after the year mark, you’ll be responsible for buying a replacement cover. For the first 10 years of the warranty, if your mattress is deemed defective, they’ll repair or replace it for you free of charge. In the second 10 years, they will repair your mattress or replace it at a prorated price. The price will depend on how far into your warranty you are; during year 11 of your warranty, they’ll replace your mattress 50% off, every year after that deducts 5% from your discount. For example, in year 12 your mattress is discounted 45% off and in year 13 your mattress is discounted 40% off. It’s important to note, if you decide to have your mattress repaired during the second half of your warranty, you would be responsible for any transportation costs associated with shipping your mattress back to them. The 25-year warranty covers the same defects mentioned above, but the warranty extends five years longer. The main differences between these two warranties include cover coverage and changes in the replacement cost in years 11-25. In both the Luxe and the Flex, the cover is apart of the design of the mattress; should these layers become defective, damages will be covered throughout the duration of your warranty. If your mattress becomes defective during years 11-25 of your warranty, they’ll replace it for you at a discounted price. During year 11, the mattress will be discounted 50% off. From years 12-15, the discount will deduct 5% every year. In the years 16-20, the discount will drop 4% every year, and in the last 5 years of your warranty, the discount will drop 1% yearly. For example, in year 13, your mattress will be discounted 40%, while in year 16 it will be discounted 24%, and in year 20 it will be discounted 10%. Having received over 20,000 five-star reviews, it appears customers of GhostBed love their mattresses. Reviews of this mattress mention it’s great for those looking for an affordable all-foam mattress, especially one that contains a latex-like material because latex mattresses can be pricey. 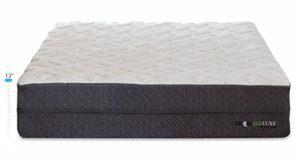 Typically, back and side sleepers find their original mattress comfortable because it’s firm enough to keep their spines in alignment while they sleep, and side sleepers are more comfortable on the Flex and Luxe models because they’re soft enough to allow their shoulders and hips to sink in. Customers also report these mattresses isolate motion well and are quiet when bearing weight, making them an ideal choice for those sharing the bed with a restless sleeper. A few of the negative reviews mentioned there’s little firmness options and the Luxe is a bit expensive in comparison to other all-foam mattresses. All in all, these are great beds if you’re somebody who sleeps hot and is looking for a medium or medium-firm mattress. If you’re still undecided, read our other mattress reviews to decide which brand is your favorite.